I lost my temper. My head was filled with nothing but a buzzing and my throat was closing with that pressure that only comes from a build-up of anger. I looked for something to take it out on- any excuse to let it come pouring out. At that point it could have easily been an opposing player who looked at me sideways. Instead it came out with one, wild swing of my stick against the corner glass and a blast of expletives directed at my defenseman- who happens to be my good friend. Both actions resulted in an echo that rang across the rink. Oh look! 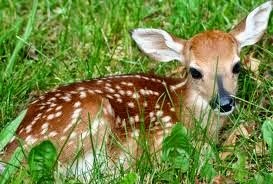 A cute little fawn. It's been 10 months since I came back to hockey and even through those first couple of painful, confused months I hadn't ever lost my composure like I did in this game. Not only had I allowed 9 goals, I discouraged my team mates with my ever-increased barking about errors throughout the game which climaxed with my outburst on the ice after the 9th puck crossed the goal line. I've lost by 7 or more goals before. I've allowed as many goals before. 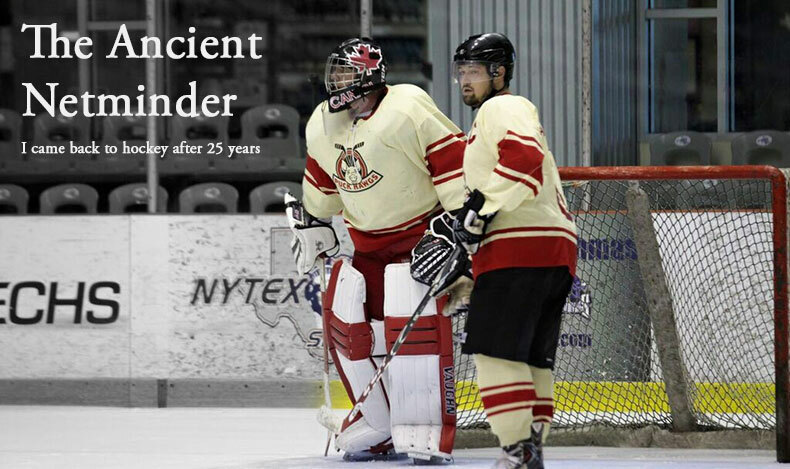 So why did last night's loss take my competitive nature beyond what's reasonable for beginner hockey? It's never one thing is it. 1. For the past month or so, playing on three different teams of varying skill & talent levels, I've felt my confidence growing and my skills improving. Even through losses, my take away was positive and I could focus on my improvements while identifying trouble areas. I felt I was on the right side of the curve. Last night after the 4th of 5th clean shot got past me, I could feel that confidence slip away. I was back to being a fraud- even for a beginner goalie. 2. It felt like my team let me battle alone and I might have caused it to happen. I try to encourage my guys on the ice- especially my defenseman after a good clear, pass breakup or the rare back check. I also shout out the best option for puck play in our zone. I do that because I see the entire ice while they're focused on the puck and trying not to trip over their own skates. Last night my building frustration at the goal count and my directions being ignored, my attitude became less encouraging and more negative. What should I expect when I'm being a loud-mouthed ape shouting at my own players for mistakes? The result was almost no support around the net, bad clearing passes onto the opponent's sticks and slumped shoulders and apologies. 3. My expectations are getting out of alignment. This is adult beginner league hockey. I'm a 47 year-old marketing professional, not a hockey player. Everyone on the ice last night is there to have fun, compete and keep their beer belly in check. I often scoff at the odd league player who decides he's going to be a bully and drop his gloves for a fight against some guy who works a warehouse job by day, I need to turn that around and look inward. I need to realize that letting my competitiveness and emotions get away from me isn't that different than the guy who wants to fight someone in beginner hockey. So there you have it, gentle reader. The goalie's soul laid open for all to see. An inside look at what leads to your beginner goalie swinging a stick at the glass and discouraging his own players with outbursts. Maybe learning the butterfly won't turn out to be the hardest lesson to learn.